ARCATA – Arcata Police have arrested two juvenile suspects and are seeking a third in the Sept. 3 arson which destroyed the playground at Chevret-Vaissade Park. Through a lengthy investigation by APD, three juvenile suspects were identified. Two of the suspects, a 12-year-old from Arcata and a 13-year-old from Pittsburg, Calif., have been arrested. The third juvenile suspect, a 14-year-old from Fortuna, is still at large. Update: On Wednesday, Sept. 28, the third juvenile suspect, a 14 -year-old from Fortuna, was arrested for his alleged part in the fire. This third and final arrest completes the investigation. APD detectives learned that the three juveniles allegedly used cardboard, small branches and a piece of wood to ignite a fire on the playground structure. Once ignited, the juveniles rolled the burning piece of wood next toa vertical piece of the play structure which also ignited. Police Chief Tom Chapman said that the Pittsburg youth was originally from Arcata. He and the others had been visiting a fourth juvenile who lives in the area and was uninvolved in the arson incident. Chapman said the 13-year-old had had previous law enforcement contact for arson and theft offenses in Arcata. An APD press release said that community support in re-establishing the playground as well as apprehending the responsible parties has been” tremendous,” and that investigators received “numerous” leads from community members throughout the investigation. As is often the case, loose talk led police to the suspects. “Word spread from their peer group and somebody came forward to say, ‘These guys are bragging about being involved. '” Chapman said. The APD press release said that there is nothing to connect these juveniles to any other suspicious fire in the City of Arcata. While numerous donations have been received to offset the $10,000 deductible and assist with purchase of a replacement playset, Chapman said the juveniles’ parents and/or guardians may also have to help pay as well. “This is the classic situation where the families will be held financially responsible,” he said. The Arcata City Council approved the purchase of a replacement play structure for Chevret-Vaissade Park at a special meeting Monday, Sept. 19. The equipment was ordered about three hours after the meeting’s end and is expected to be delivered by Friday, Oct. 14. 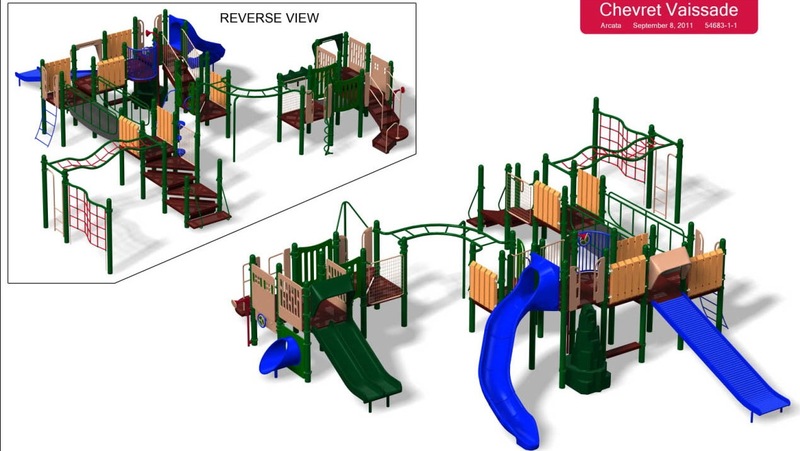 According to City Parks Superintendent Dan Diemer, installation will begin immediately after the play ground equipment is received from Landscape Structures, Inc. of Delano, Minnesota. Construction will be completed, weather permitting, within three weeks. To date, the City has accepted several donations from community members, neighboring residents, businesses and non-profit organizations. The donations are expected to cover a large portion of the $10,000.00 deductable from the City’s insurance policy. The City Council will formally accept the donations at the Wednesday, October 5, City Council meeting. Donation checks, made out to “City of Arcata” with “Chevret-Vaissade Playground Fund” written in the memo section, can be mailed or brought to the Arcata City Manager’s Office, 736 F Street, Arcata, CA 95521. For more information about park reconstruction and updates, click the “Hot Projects” button on the City’s website, www.cityofarcata.org or call (707) 822-5953. This entry was posted on Tuesday, September 27th, 2011 at 4:23 pm	and is filed under News. You can follow any responses to this entry through the RSS 2.0 feed.